Event handling and listeners What is an event? 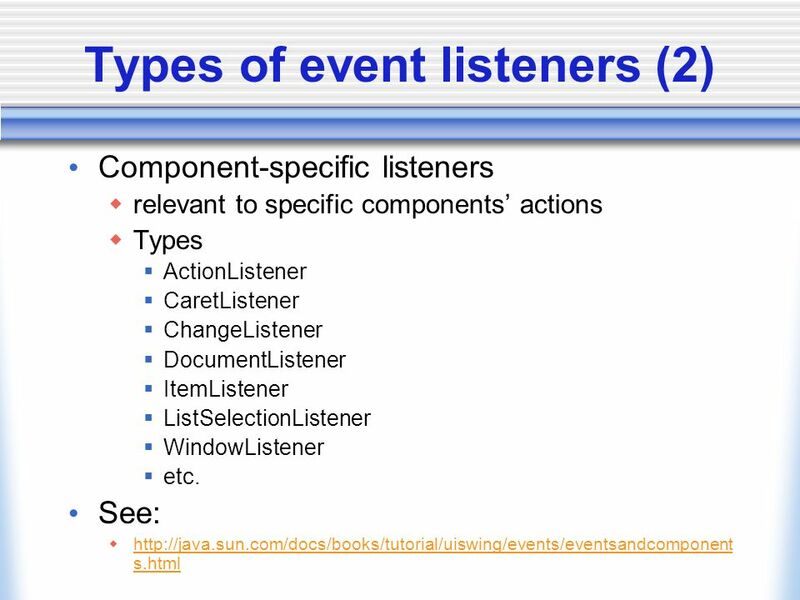 user actions and context event sources and listeners Why should my programs be event- driven? User interaction. 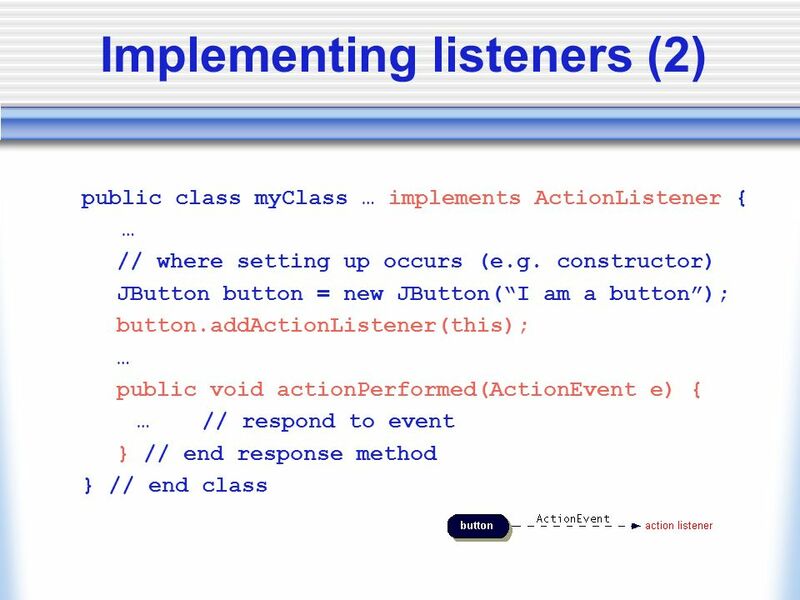 9 Adapters for event handling (1) Classes which implement listener interfaces must implement all listener methods e.g. 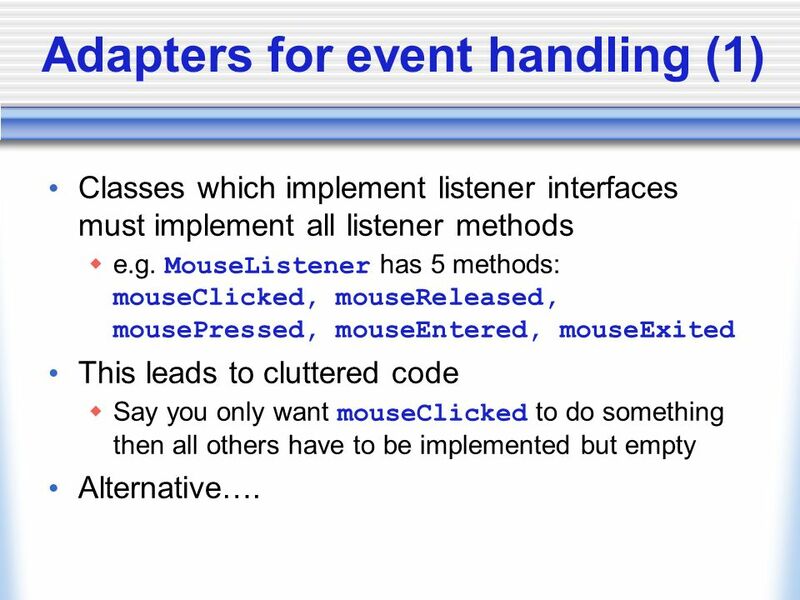 MouseListener has 5 methods: mouseClicked, mouseReleased, mousePressed, mouseEntered, mouseExited This leads to cluttered code Say you only want mouseClicked to do something then all others have to be implemented but empty Alternative…. 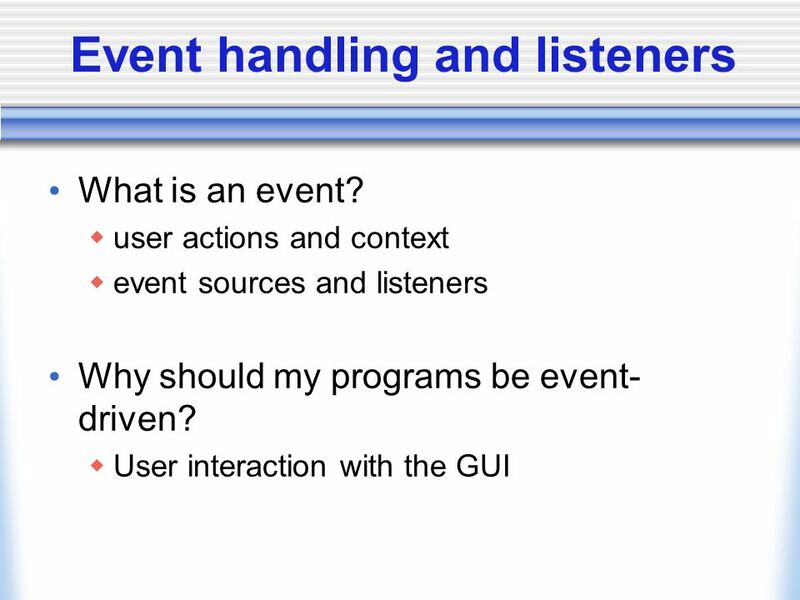 Download ppt "Event handling and listeners What is an event? 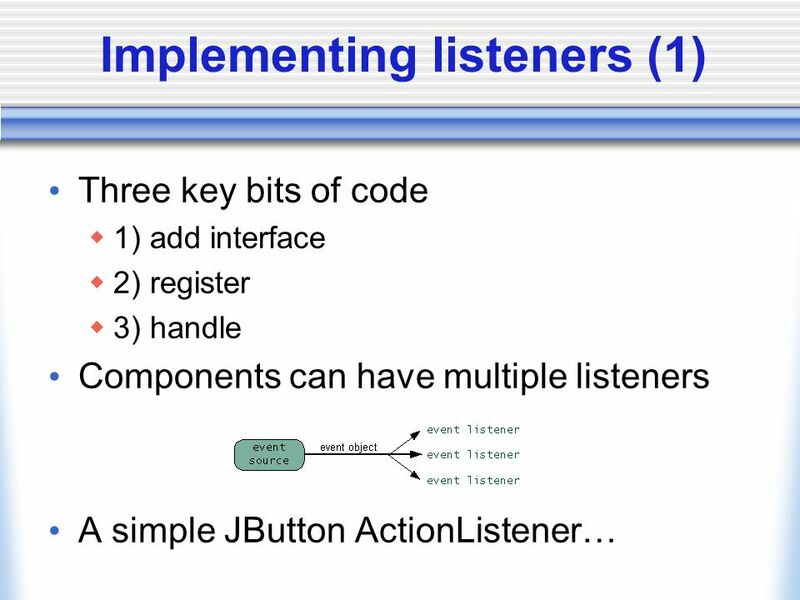 user actions and context event sources and listeners Why should my programs be event- driven? User interaction." 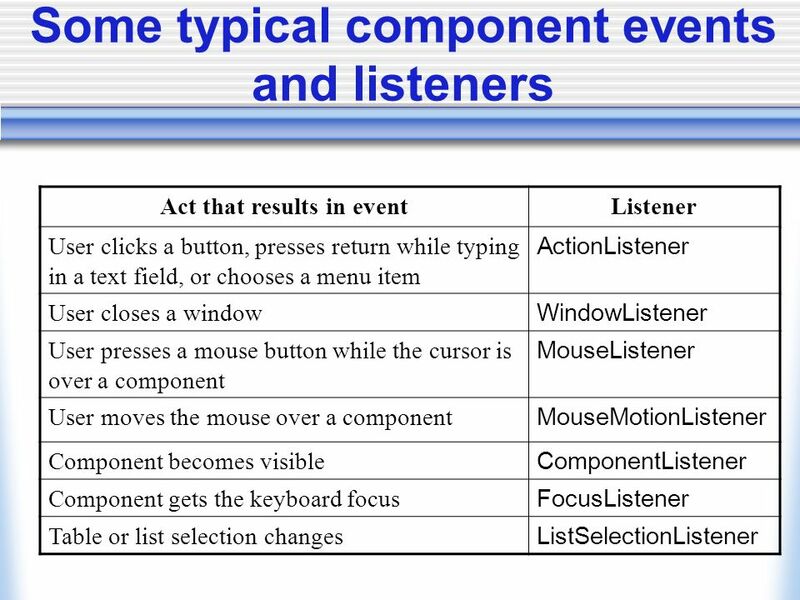 1 Event Listeners Some Events and Their Associated Event Listeners Act that Results in the EventListener Type User clicks a button, presses Enter while. Programming in Java; Instructor:John Punin Graphics and Graphical User Interfaces1 Programming in Java Graphics and Graphical User Interfaces. 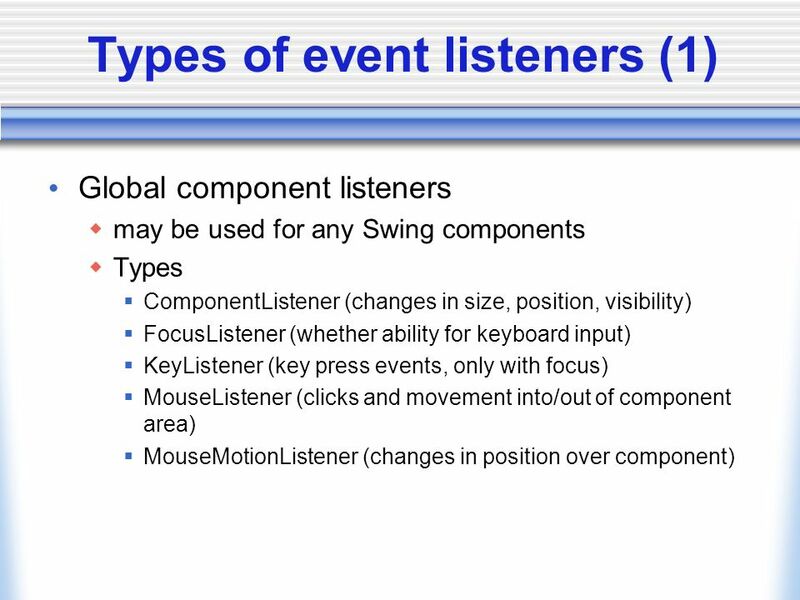 Mouse Listeners We continue our examination of GUIs by looking at how to interact with the mouse –Just as Java creates Events when the user interacts with. TCU CoSc Programming with Java Handling Events. Jan Event Handling -1.1 Yangjun Chen Dept. Business Computing University of Winnipeg. Events and the AWT The objectives of this chapter are: To understand the principles of the Java 1.1 event model To understand how the event model is used. Event Handling. 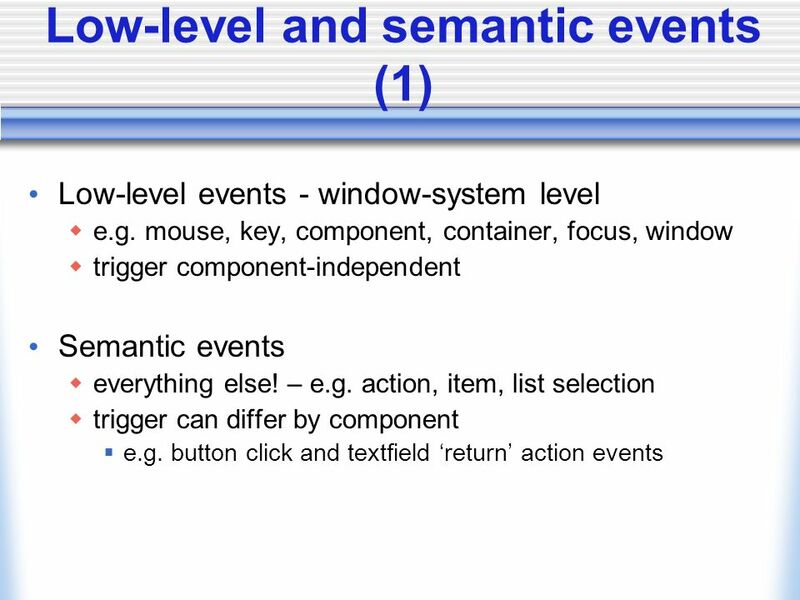 In this class we will cover: Basics of event handling The AWT event hierarchy Semantic and low-level events in the AWT. Event Handling Events and Listeners Timers and Animation. Lecture 24 Applets. Introduction to Applets Applets should NOT have main method but rather init, stop, paint etc They should be run through javac compiler. Events ● Anything that happens in a GUI is an event. For example: – User clicks a button, presses return when typing text, or chooses a menu item ( ActionEvent. Event-Driven Programming Event:  A signal to the program that something has happened.  It can be triggered either by external user actions, such as mouse. GUI Event Handling Nithya Raman. What is an Event? 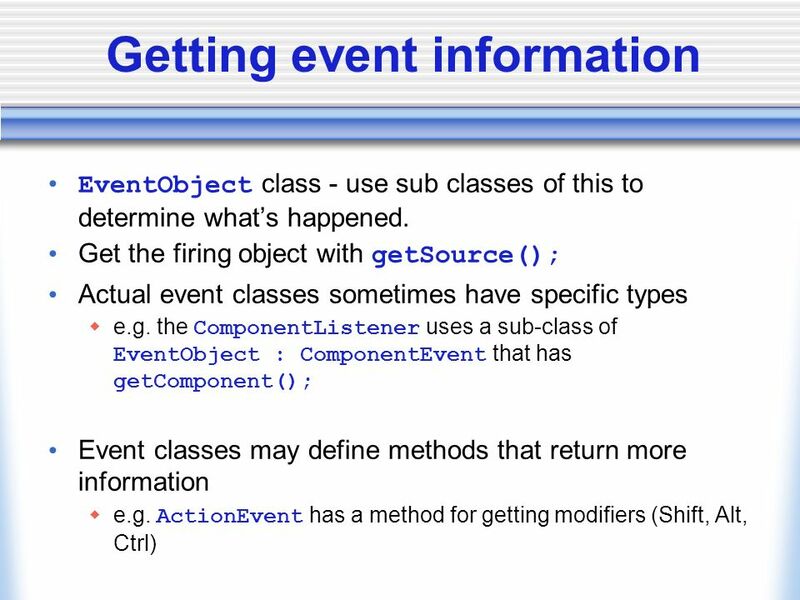 GUI components communicate with the rest of the applications through events. The source of an event. CS-1020 Dr. Mark L. Hornick 1 Event-Driven Programming.